A group of musicians who graduated from the University of the Philippines have collaborated for a song to fire up UP fans in the hours before their sudden-death semi-final match-up with the Adamson University Soaring Falcons in the UAAP Season 81 men’s basketball semi-finals. Musician Raymund Marasigan, known for his involvement in bands such as the Eraserheads, Sandwich and Pedicab posted in a tweet his collaboration with rappers BLKD and Rye celebrating the UP Fighting Maroons’ successful drive to the UAAP Final Four to end a 21-year-long post-season drought. In the tweet he said that the project was conceived on the fly and that they were lounging in the UP Diliman Campus when they decided to push through with the project. BLKD, who first gained prominence for his participation in the FlipTop rap battle league, graduated from the school’s College of Social Work and Community Development. #AtinTo! Para sa UP Fighting Maroons at sa buong UP community. #UPFight! Fans of the Fighting Maroons showed their appreciation for the musicians’ gift to the community. Thank you @pauldesiderio18 for giving us this battle cry. Thank you @upmbt for embodying it every game. Thank you Rye Armamento x @imBLKD x @raymsmercygun for making it into an anthem. Marasigan is known for being the former drummer of the Eraserheads, who gained widespread popularity in the ’90s. The band, which was formed by other state university students, also featured references to the UP school system prominently in their songs. While the UP faithful used music to voice their support for their alma mater, the Adamson Pep Squad meanwhile stirred up excitement around their campus near San Marcelino Street in Manila by letting their drummers perform on the roadside. Both the administration of Adamson and the Manila campus of the UP system suspended their afternoon classes to allow students to cheer for their respective teams. 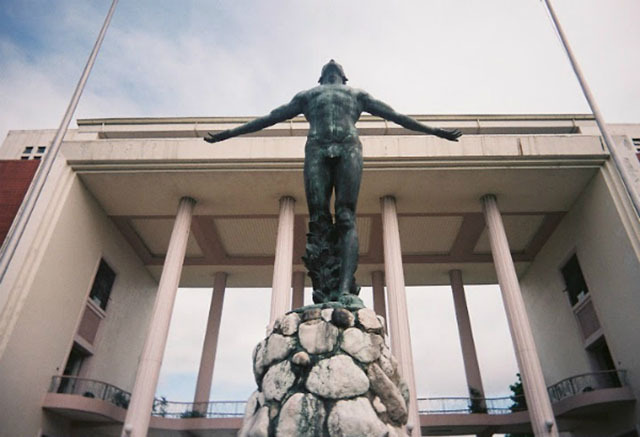 UP’s Diliman campus on the one hand announced that it will be putting up screens and projectors in certain buildings on the campus to allow students to catch the livestream of the highly-touted match. Both Adamson and UP have not reached the finals of the UAAP Men’s Basketball tournament since the implementation of the Final Four format in 1994. Adamson last won the trophy in 1977 while UP last tasted the gold in 1986.